The new McCalls Spring Patterns have been released, including two new Archive Collection designs. I thought that we might get more 1930s silhouettes, but it looks like the 1950s/60s are the most marketable of the vintage decades. The double-breasted look is not that exciting, and I don’t know that I have anything quite like it in my (rather massive) collection of patterns. But honestly, I can take it or leave it. The other vintage reproduction is a very basic silhouette. I have come across quite a few vintage garments with this exact look, but have never seen this specific pattern. However, I know that I have a kimono sleeve/dirndl skirt in my stash - add the front bow to the side seams, and there you have it. But where are the vintage illustrations?! That can sometimes be my favorite part of these vintage reproductions, and they are nowhere to be found. I would probably be more inclined to like these if I had that image in mind. Hint, hint, McCall Company. The rest of the new patterns include quite a few shirt dress designs, some very 1990s silhouettes and a Tracy Reese dress with an interesting under bust seam (is it enough to make me purchase it? . . . only time will tell). And what the heck is this?! A dress becomes a fitting shell, becomes a dress form, becomes a Halloween costume?! What is it supposed to be? Any guesses? Galliano dressed his mannequins as actual mannequins in a couture collection in 2005 which I actually loved, but this dress is disturbing me . . . is that an actual metal dress form cage she is wearing???! This has to be an inside joke. I totally missed the last one when I looked at the new patterns. Who knows what they were thinking. I was really dissapointed as McCalls lately has been making patterns to my liking, but not this time. :( Oh well, I need to stop buying patterns as I have hundreds. Joi Mahon who is a new McCalls designer made that fitting pattern to go along with her new book, Create the Perfect Fit. the artistic photograph is interesting but like you I ask why? There was nothing that I wanted from this collection either. It's so hard to think of early spring when the cold season is really closing in around us! EVERYONE is doing 50s retro. If I want a vintage large skirted dress then Vogue is my first port of call, or Gertie's whose kimono sleeve dress at least has an underarm gusset. No one has the 30s and 40s back catalogue that Mccalls WHY are they producing this dross? I don't understand their thinking. I guess this stuff must be selling, or they wouldn't keep producing more of the same . . . but it is rather disappointing. I too am finding overlap in my pattern stash with the repros being released. 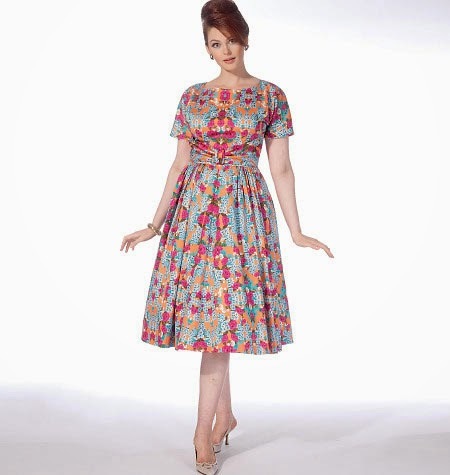 I do, however, have a ton of 1950s-mid 60s patterns. It's not surprising that era and the silhouettes are so popular. Besides the obvious ongoing trend for all things mid century (thank you, Mad Men), I think a lot of women perceive it's a more attainable silhouette. Earlier decades are seen as having either more extreme design features (strong shoulder line of the 40s) or require a foundation garment to truly look correct (the smooth waist to hip line of the sleek 30s). So mid century is more "friendly" for modern sewers. Just my $0.02 though! ;-) I would love to see the big four release more variety! Pretty much all the other designs for the spring line are "eh" for me. If they are on super sale I might pick up one or two, but none are screaming to be bought! And does #7091 remind anyone of the Truffle Dress in The Colette Sewing Handbook (but with a fuller skirt)?! That is an interesting point. I always think the wasp-waist of the 1950s is harder to duplicate without foundation garments, but even without a tiny waist, what you get is a cute, feminine shape. And I guess shoulder pads do have a bad rap, probably the fault of the 1980s. With all those muffin tops walking around on the streets it seems odd that anyone would mind looking lumpy in a bias cut dress, but I suppose if one is trying to emulate the old Hollywood images of stars some serious Spanx is going to be required! And I definitely see the Truffle! We all understand the allure of 1950s, but that's not what we hoped for when McCalls announced their project. Their designs for 1940s evening wear is unmatched. Those soft draped and oh so feminine lines are so hard to find and they fetch hundreds of pounds or dollars whenever a good one appears for sale. I agree some the 1930s and 40s wear is severe but equally there are so many incredible designs literally making you swoon. That's what I was expecting and what many thousands of sewers want, and only McCalls has the power to make it happen. That last photo of Joi Mahon's model in a weird fitting shell/dress form thingy is bizarre, but once you've seen her fitting technique it makes more sense. Really. And from what I hear, she has some new designs coming out for McCall's soon that incorporate her fitting method, so this is probably just a teaser for that. I don't think McCall's has really lost their collective mind, at least not in this instance. But it is confusing to see if you don't know what it is. Thanks for the clarification! As someone unfamiliar with Joi Mahon, the photo was very strange. bahaha! at the last one!! That is going to be my Halloween costume next year! The Tracy Reese dress does have an interesting seam. I wonder why they chose fabric that completely hides this, as it seems to be the main feature. I often find their fabric choices very odd, indeed. And I agree . . why hide the one thing that makes the dress interesting?! What the heck? These are really pretty bland, like you said. And the last picture is very strange. Maybe it does go with the fitting method, but don't McCall's marketers know this picture is going to be seen separate from that fitting information? It doesn't make sense alone! Agreed, ladies. I think the McCall's marketing is out of touch. They are marketing to what the average woman might wear without acknowledging that the average woman doesn't sew. People who do sew tend to want the unique and interesting, but not the bizarre. Thank goodness for indie patterns and vintage patterns. This all just makes me cranky. No, ask me what I think you should put out, and ignore it (because my opinion really does not count). I don't really care, but I feel that McCalls has done a disservice to Ms Mae's good nature in spreading their word and for what? 7087 doublebreasted is a style I don't believe I own several of, which is saying a lot; the overlap and redundancy of the reproductions has been depressing and unsurprising. As for the 7086, the dirndl skirt has been beaten to death in general. I do like the 7089 cage skirt; it reminds me of that off again, on again 'frame' dress I threaten to make, just sewing boning together on seam lines. And I am a fool for a 'new' fitting system, as my bookshelves can attest to. Ha! That last photo is hilarious! Yes, it would make a great Halloween costume.